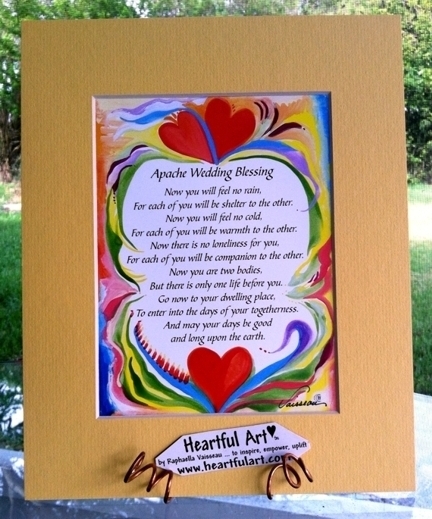 8x10 print of the Apache Wedding Blessing with art by Raphaella Vaisseau. 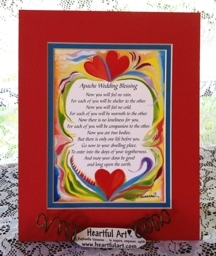 This beautiful blessing is a sweet gift for couples of any faith for engagements, weddings, or anniversaries. It is available in many sizes and forms. You can have it as a magnet, a matted print for the wall (5x5, 5x7, 8x8 or 8x10) or a poster in three sizes (5x7, 8-1/2x11, 11x14). Art and design varies.